Here are a few simple reasons! 1. Rack position squats : hold kettlebells OR dumbbells at your shoulders and maintaining that position sit into full squat. 2. Seated or "BOX" squats : use a bench or block and sit all the way down WHILE maintaining "good" squat form (shins & torso should be parallel). Encourages activation in the posterior chain (back-flutes-hamstrings). Builds strength-power & awareness in the bottom range of the squat. 15 workouts in 30 days! I am getting married in 4 months and it is time for me to getting that bride-body-ready as well summer-body-ready. 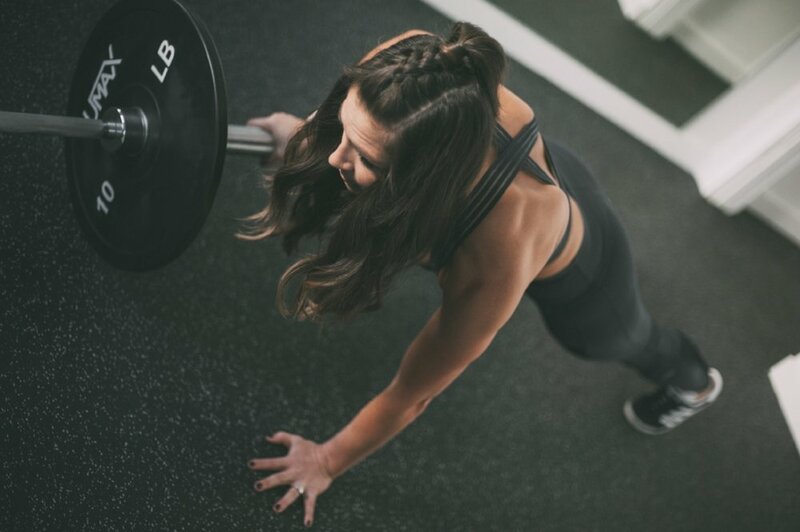 15 workouts out of 30 days is a perfect way to kick it off. Most people start getting ready for summer in June BUT if you really want to make REAL changes you have to start sooner rather than later. TODAY is truly the BEST day to get the train on the track. I am going to OFFER 15 complimentary workouts on instagram. So tune in every week. The Rules of the Challenge! Q: How do you know if you’re doing them wrong? Planking is the best, safest way to strengthen your core without compromising the spine. 1. Plank with landmine roll - featured in top picture! If you do not have a landmine, use a medicine ball under R hand and roll to L, repeat. 2. Bosu plank - use Bosu instability ball under forearms to add a new challenge to the core. 3. Side plank hip taps - drop your bottom hip to the ground and touch gentle and lift back up into a full side plank, 10-15x on each side. Meditation... a hobby for professional athletes, yogis, actors as well as YOU and ME! Countless research as well as thousands of years of human experience ACROSS cultures and time have illustrated the profound and often immediate results of consistent meditation. I personally use both "Headspace" as well as "Simply BE" apps to guide and direct my meditations. February is the shortest month of the year, so simply NO BREAD and RED MEAT for the following 28 days, PROMISE. I believe in YOU! Cravings only last about 60 seconds or less, if you can distract yourself for a minute or less, you will move on. In one minute what can feel unbearable will pass if you think or DO something else. Like taking a walk outside, drinking a glass of water, doing a plank or even listening to your favorite song. The January Challenge got me thinking... instead of waiting for the 2018 challenges to knock on my door, I am going to create "challenges" for myself every month of the year. Small additions and subtractions to my lifestyle. I hope you join me! We all know that changing our habits can change our lives in small and enormous ways. AND we have all read (and tried) enough inspo quotes, self-help book covers and diet fads to know that habits CAN BE hard to change. Let’s do it together to make it easy. WHY are monthly lifestyle challenges helpful? Simple curated monthly challenges designed to enhance mental, emotional and physical wellness can create short-term motivation to start habit change. Some habit change means shifting to include something new and others include extinction or removal of a behavior. EVERYONE! Find a buddy to play this game with you, it makes it more fun and easier to complete. HOW do you complete them? COMMITMENT vs INTEREST. When you commit to completing the challenge you will, if you are interested in completing the challenge you may or may not complete it. We all know about New Year’s resolutions, BIG commitments that tend to become small speed bumps on the road to forgetting about them. The January Challenge is about being proactive in preventing the holiday blues, creating action towards healthy lifestyle habits and using the momentum of New Years to make it all happen. 1. No alcohol for 30-days (DETOX THAT LIVER and mentally challenge yourself, I dare you, double DOG DARE). 2. 1-liquid day (you choose the day, I would recommend one that you can accommodate the shakes, juices and broth that are a part of it). 3. 6-8 miles of running a week (24-32 miles for the month). 4. Find a buddy or pal to do the challenge with you! 5. Make a reservation for a fancy dinner or something special for yourself on January 31st. It is always a healthy challenge to remove and re-enter dietary and lifestyle habits just to self-observe that impact that habit has on your mental, emotional and physical health. Alcohol is an easy target, but taking out running for a runner can be just as powerful for mental, emotional physical health. In terms of social setting, I would just recommend you get your drink on your own (soda & cranberry or soda & lime) and honestly try not to make a big deal out of it. If you are not fazed by it, no one else will be. Also, look at your calendar if you have 1-2 nights that are important or special for you to have a few drinks, that is fine, just keep it those nights. 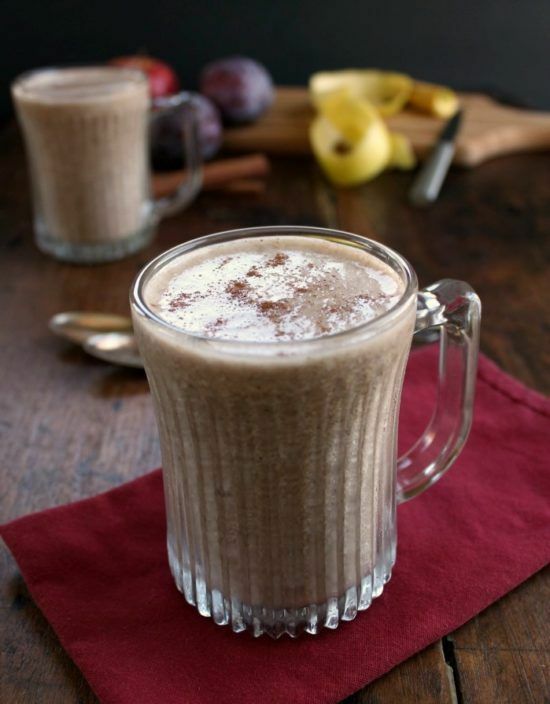 Directions: Blend all the ingredients together until the texture is smooth and as liquid as you want (you can add or take away Almond milk as necessary for your personal preference). This is a just an easy challenge to increase your movement and steps every week. They can be run-walks, where you either run and walk on a set schedule OR you run until you need a break and rest until you have almost recovered and begin to run again. An example of an intermittent run-walk is to run for 3 minutes, walk for 1 and repeat for the entire run-walk. Both styles increase your cardiovascular capacity. We are social creatures therefore doing something, anything, but especially something that is challenging is more fun and easier with a pal. I always ask a few friends when I am trying something new or at least have a friend I can talk about the experience with. Also, please share your stories with ME! Check my Instagram and send me what’s happening in your January Challenge. WE CAN TRICK YOUR MIND TO LIVE THE LIFE ON YOUR DREAMS…more on that topic in later blogs. I was talking with my client this morning and she introduced me to the term, "golden handcuffs." She was referring to her career but I realized how many aspects of my life this term relates to. I can't count how many times I have turned even the most fun parts of my life into obligation. The best advice I have ever received is actually a question; what do you want? I was taken aback because I wanted so many things but really underneath it all, I wanted/want freedom. As it turns out, freedom from the handcuffs, I painstakingly crafted myself. Of course, they are gold spiked and fabulous but restrictive nonetheless. Sometimes I wake up with my cuffs on the floor and it's easy to jump out of bed geared up but other days I wake up feeling my cuffs cutting in my wrists. On those days, I remind myself that I don't HAVE to do anything ever again and I get to choice how I paint the canvas of my day. I was reading an article by Robert Panariello and he quoted a football coach saying, "know what's important and don't worry about the rest." He was talking about programming for athletes but I just feel in love with the simplicity of it for life programming. What brings 12 people and 2 supporters, who were strangers 6 months ago, together to be electrocuted in hot pink? Well it’s starts with individuals looking at their lives, looking at themselves and saying, you know what, I am capable of more. Everyone looks in the mirror and thinks this at some point, it may look/sound/feel different but it happens to us all. Some of us take a course, some of us buy a new car and some of us sign up to jump into ice bathes. Tough Mudder has become one of the most profitable obstacle courses making Will Dean a millionaire in only 2 years. There are many business decisions that Dean made to get Tough Mudder to where it is today, but the first step was developing a good product that people want. Tough Mudder falls in line with other weekend warrior urbanathons, but what makes it different is that the focus is on camaraderie and teamwork, as opposed to “winning” or being "perfect." Player beware that the game makers have a sick obsession with live wires. Back to the 12 apostles and their 2 supporters. 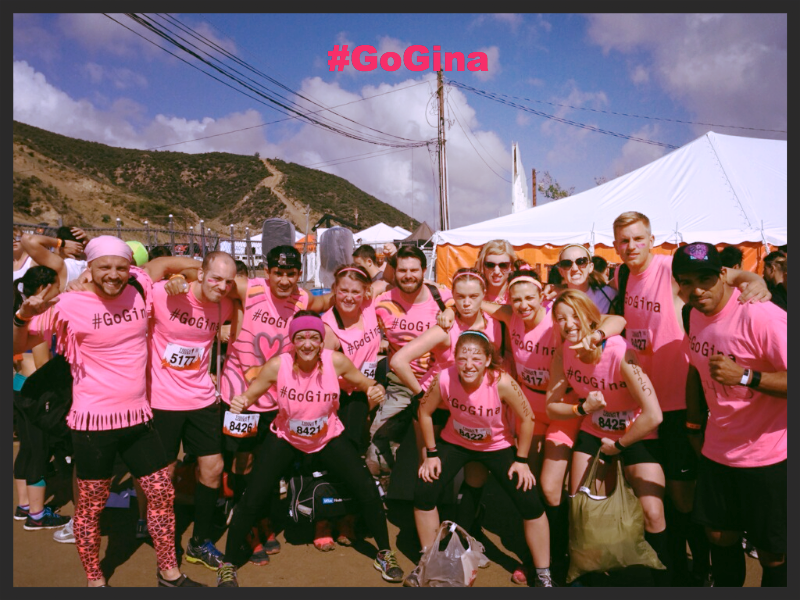 Each one of us had our own #GoGina moments throughout the day; for some it was pure fitness, some it was overcoming fear of heights, for others it was being patient, for me it was being responsible for a team. Everyone kept asking us "Who is GINA?" And our answer is, "YOU! You are Gina, she is in everyone." Gina is that place of fearless freedom in your heart. When you have a #GoGina moment, it is when your heart overrides your head. Take aways: Supporters make everything worthwhile. I will pretty much do any physical feat as long as I have supporters holding signs and shouting my name.